The CIO Executive Council adapted the 9 core competencies crucial to C-level success specifically for the IT profession, applied them to The Future-State CIO® model, and built them into a 360˚ Future-State assessment tool for CIOs and rising IT leaders. The Future-State assessment tool is based on Egon Zehnder’s own in-depth analysis of more than 25,000 C-level executives via face-to-face interviews. The assessment requires the IT professional to answer a series of CIO designed questions across each of the 9 core competencies. 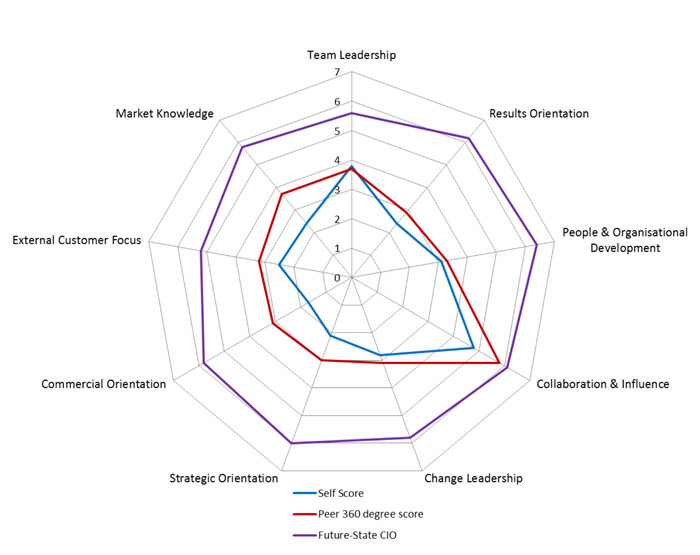 The results are graphically displayed to show the participants strengths and weaknesses across each core competency and are benchmarked against Future-State CIOs as identified through Egon Zehnder’s assessments process (those who scored in the top 15th percentile). Participants are also required to invite their peers to complete a 360˚ review of their skills based on the each core competencies which are also displayed against their own results. This is a valuable tool at both the individual and team level. At the individual level it provides participants with a clear snap-shot of where they are currently, along with where their peers view their strengths and weaknesses. This information can then be used to create a personalised competency leadership development plan to ensure future success. At the team level it allows organisations to benchmark their leaders and provides a clear view of strengths and weaknesses across their leadership bench. Once an organisation understands the competencies they have, and those they lack, they can determine which competencies need to be developed further to ensure the realisation of their business goals. The Future-State assessment tool is included in Council membership at the C-level. However, it can also be purchased as a separate service. Contact joyce_long@idg.com.au to find out how.